Since 1987, the Waterfront Center of Washington, DC, in an annual juried competition, has recognized excellence in waterfront projects, plans, citizen organizations, and student work - those that show sensitivity to the water, public spaces, unique historic and cultural features, human scale, civic pride, economic sustainability, and environmental values. Friends for Our Riverfront was honored with the 2009 Clearwater Award, given to citizen organizations that embrace these values for their waterfront. FfOR secretary Renee Lartigue and president Virginia McLean accepted the prestigious international award on behalf of FfOR on Friday, Sept. 23 at the annual Waterfront Center conference, held this year in Seattle. The transcripts and comments from the TDOT/Army Corps public meeting on August 11 about the Cobblestone Landing have been published and can also be found at the links below. There are in several PDF documents, which I suggest you save to your hard drive for reading. "You need to make the heart, or center, of the city attractive, safe and lively. People help nourish and sustain the city. In the restoration of a city, you need to be sure that you restore that sense of people wanting to be active. It's not just about the tax base or the jobs. What the top cities in the world have is a happy, active public realm-the arts organizations, festivals and events that allow people to celebrate their city and love their city." 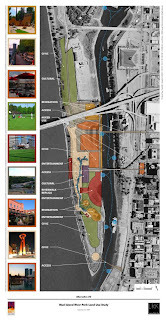 The RDC has a contract with the City to be the exclusive developer for the riverfront, including Mud Island River Park. The basis for this contract is the 2002 Cooper Robertson Riverfront Master plan. The land bridge (and lake) in that plan turned out to be very bad ideas. The land bridge was quietly taken out in 2005. That effectively gutted the plan, making it obsolete and irrelevant. If we admitted it and just threw plan away, we’d be admitting the RDC itself is obsolete and irrelevant. Jobs must be saved. Reputations must be preserved. The RDC must come up with a new master plan before contract renewal. The Mud Island Land Use Plan (MILUP) will arrive in time to save their contract. To be credible, MILUP must involve the public in a “process” of some kind. To avoid tying RDC's hands, MILUP can’t be too specific. To be legally sufficient, MILUP need be little more than a zoning map. When the public finds out they are getting little more than a zoning map, they will feel like they have been used. You won't be getting a skatepark, but maybe your children will. Just got back from the second meeting. My overall impression? This was a step backwards. They've got three versions of a color-coded zoning map, and that's all they wanted. The citizens' work is done. No specific plan, no theme, no unifying vision. Move on, somebody else will make the decisions from here on out. Continues...The RDC has a big problem and the MILUP is intended to solve it, but it’s not the problem you might think it is. To help you understand what the MILUP process is really about, I need to take you through some background and history. In reality, the RDC is not a public agency or commission* but a private corporation. Besides a bank account and some office furniture and equipment, it has one very big asset. It has exclusive authority for developing and exploiting the Memphis Riverfront, which is of tremendous value if it can be fully realized. But the RDC only possesses this authority by way of a City contract that must be renewed from time to time. In reality there are two contracts, one for management (renewable every 5 years), and one for development (renewable every ten years). To keep the management contract, it merely has to do a good job, at a reasonable net cost, and keep the public happy. In the RDC’s mind, the management contract is mainly tactical. The development contract is the strategic one for which the RDC (middle name: Development) was really formed. That contract presupposes the existence of one other, very important thing: an approved master plan. A master plan is the supposed to be an overall framework for the development projects the RDC will propose, get approved, and implement over the term of the contract and subsequent renewals. To repeat: There cannot be a development contract without an approved master plan underlying it. Indeed, the contract specifically refers to it. 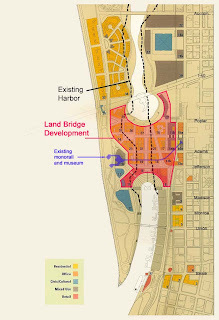 Both are necessary conditions for the RDC’s continued existence as the riverfront developer. Currently, the master plan of record is the one drawn up by Cooper Robertson and Partners in 2001 and approved by City Council in May, 2002. Call it the 2002 Master Plan (capital letters). The development contract based on that plan was executed in early 2004. It comes up for renewal in 2014, but requires two years' notice of non-renewal. By 2005, high-level officials of the RDC and within the City administration had realized that the 2002 Master Plan was very deeply flawed. Even worse, word of its flaws had leaked into the community at large, thanks in large measure to the grassroots organization Friends for Our Riverfront, which had, on its own, figured out these problems. 1. The lake would have been an environmental disaster, trapping the runoff and pollution from most of North Memphis. 2. The land bridge would have created a prestigious “new downtown” that competed with the old downtown, which by then was already languishing. 3. The plan would have cost taxpayers $300 million or more to implement. Something had to be done, and swiftly, before things got too out of hand. The land bridge was the centerpiece of the 2002 Master Plan, so the proper thing to do would have been to go back to the drawing boards. But there wasn’t the time or money to draw up a new master plan. Regardless, doing so would have been a major embarrassment, calling into question the RDC’s own competence for having proposed the 2002 Master Plan in the first place. So in October of that year the RDC’s board decided to just delete the land bridge and lake from the plan. They got the City Council to ratify the decision in January, 2006. The Council’s resolution was a single sentence. The RDC needed to look busy. The only two pieces they could conceivably start working on were the Public Promenade and Beale Street Landing. The Public Promenade was very problematic. To do that plan the City would have had to file an eminent domain lawsuit taking the land away from the public domain. Politically speaking, that wasn’t very palatable. Therefore, Beale Street landing became the all-important project for RDC’s own continuing survival. It therefore took on a life of its own, and a direction that was markedly different from what was described the original 2002 Master Plan. In fact, it’s sucking the life out of the Cobblestone Landing right next to it. Even still, the BSL project would only carry the RDC at most through 2012. Their development contract comes up for renewal in 2014 and requires two years’ advance notice of non-renewal. That is cutting it too close. Their predicament became all too obvious in 2008, when Wanda Halbert and other new City Council members asked RDC for an explanation of the Master Plan. The transcript of that Parks Committee meeting can be read here, here and here. Hoping not to have to show the Master Plan’s drawings (which of course were obsolete), the RDC brought only three hard copies and produced them only when someone asked for them. Instead of showing pictures, they did a lot of hand waving and talked about the Master Plan being more of a “vision” than a specific plan. HALBERT: I hope you all understand what I’m saying. This just does not appear to be a City project. This appears to be an RDC project. And the final comment that I have is, also during the budget hearing… I mean I asked the question because I didn’t know what this was. Who are you? Where did you come from? How long are you going to be here? How long are we going to be dealing with this? And you all said that the Master Plan was a 50 year plan, but we have five-year increments [of] contracts with RDC. I can understand putting together a concept that we think may take up to 50 years. But we hire the experts to come in and, here’s our direction, this is what we need to do, whether we agree to it together… But if this is going to be going on for 50 years, I mean even though we’re approving it five years, to me the City needs show, where is your ownership of this? What is the CITY’S direction? It’s just…that to me is where some of the confusion is coming from. I don’t see…what I see in you, the leadership in you and the expertise; I need to be seeing that for the City. And I’m missing that. And I’m going to talk to the Mayor, and I hope his administration is listening. They need to have ownership of this, and they need to tell us, where are we going with this. I mean, I’m feeling like other entities OWN the City’s business. And that’s just how it looks to me. Because this meeting was the RDC’s show-and-tell, Wanda Halbert and other City Council members did not get fully briefed on the quality of RDC’s “vision” e.g. the near-disastrous land bridge idea. The RDC realized that sooner or later, the 2002 Master Plan would have to be put out to pasture, but, since their development authority rested upon it, that couldn’t be done until there was another plan to replace it. They needed a new plan that could serve as the basis of RDC’s development authority for the next 10 or 20 years, and could be turned into a pretty brochure for marketing purposes. That was the real purpose and intended outcome of the Mud Island Land Use Plan process. It only needed to be specific enough to qualify as the “new master plan,” and to serve as the basis for renewing their development contract when it comes up for renewal. A color-coded zoning map is easily specific enough. Too much specificity would unnecessarily tie the RDC’s hands. It was also important to be able to claim that this plan was the result of a true public process. That’s why the RDC held a six-month dog-and-pony show. But the public has been misled into thinking that the process would determine what will actually be built on Mud Island, if anything. In reality, the public was being used to legitimize the MILUP “zoning map,” which could then be used to re-legitimize the RDC itself. The final step in the RDC’s process (not the public one) is to get the City Council to approve this color-coded zoning map. Then the RDC’s problem will be very neatly solved. They will have a new master plan as a basis upon which they can renew their development contract for ten or twenty more years. * By the way, here’s an interesting factoid: Did you know that Benny Lendermon (president of the RDC) makes quite a bit more than the Mayor of the City? Lendermon’s cash salary is well over about $200,000, plus benefits. On top of that he also collects a City pension. The Mayor's base compensation is currently $171,500. If the RDC were really an arm of the City government, not a private corporation, would that $200,000-plus salary package be possible? Correction: According to the company's IRS filings for 2007-2008 (latest available to me), Mr. Lendermon's cash salary was $197,405, plus an employee pension plan contribution of $14,764. The short and sweet version of this article. Beale Street Landing vs. Mud Island. An extended discussion between Shea Flinn and Benny Lendermon during the 2008 budget hearings. RDC Presentation of the Master Plan, Part 2. Much spinning and misrepresentation by Benny Lendermon while trying to explain the land bridge and the Promenade Plan to City Council members, during the 2008 budget hearings. A Dam Shame: The dam was damned from the start. So how did it survive so long? by John Branston in the Memphis Flyer, October 21, 2005.